I’m so excited….just finished my fourth open water dive and now I am officially certified!! Woo hoo! Now I have the rest of the week to dive, except for the day before I leave. I know I’ll be doing a boat and shore dive on Thursday, so that should be a ton of fun. I saw such cool multicolored fish today and a pretty big jelly fish and stingray. Last night we went to the “Taste of Bonaire,” which is held four times a year and features food from the local restaurants, craft vendors and live music. I tried goat and iguana stew, goat’s blood, and fish balls. Hmm…yum! It actually wasn’t that bad. The only thing I wasn’t crazy about was the cactus soup. Tonight is BBQ night at Captain Don’s! Ok, enough with this computer…I must go back in the water! 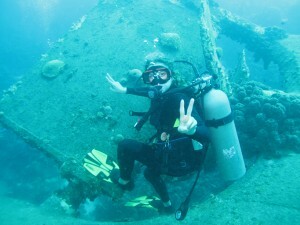 Previous Post: Two Dives Down, Two Dives to Go! Next Post: Dive Into Bonaire!